Balgruuf the Greater, a Nord warrior, is the Jarl of Whiterun, and a direct descendant of King Olaf One-Eye. An admirer of the Greybeards, Balgruuf made the pilgrimage to High Hrothgar in his youth. He has carried on a rivalry with Ulfric Stormcloak since they both were young. He had multiple children, including Frothar, Dagny, and the youngest Nelkir. While considered to be an honorable warrior who puts his heart and soul into his service, he is also not considered a patient man. 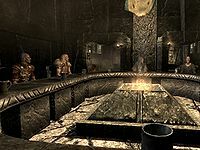 Following the White-Gold Concordat, which Balgruuf had no influence in negotiating, he was purportedly given chests of gold and told to accept the terms. However, he continues worshipping Talos privately, and according to Nelkir, hates the Thalmor as passionately as the Stormcloaks. For more information, see the lore article. He wears noble clothes, a pair of fur-lined boots, and a gold and ruby circlet. He wields a steel sword and carries a selection of upper-class loot and gold. On a normal day, Balgruuf gets up early, at 5am, to head the main hall for a one-hour breakfast. Then, at 6am, he'll get up and take a seat on his throne. At 8pm, he leaves his throne and heads to his quarters to go to bed. 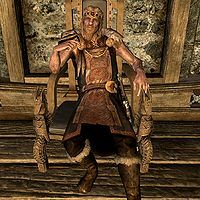 If he's still Jarl, he and Proventus Avenicci will also be present at Kodlak Whitemane's funeral. When greeted, his impatience becomes clear, saying, "You should be talking to my Steward. ", "I'm the Jarl, not a barkeep. Speak your business. ", "Quickly now, or would you prefer I let Whiterun fall to the Stormcloaks? ", "You might be a guest in Dragonsreach, but you're starting to try my patience. ", "What is it that you need? ", "You have my attention. ", and "Speak your mind." Once you get on his good side, he may say, "It pleases me to see you again." While he's neutral, you can ask him whose side he's on, to which he'll say, "If it's the war you're referring to, I'm on the side of Whiterun. No doubt General Tullius and his friends in the Empire will tell you that I owe them my loyalty, and perhaps I do. Ulfric Stormcloak would say that I owe my allegiance to the Nord people as they fight for Skyrim's independence. Perhaps this is also true. The day might come when I am forced to draw my sword for one side or the other. But that day has not come yet." You can also ask him why he thinks Ulfric killed the High King, to which he'll say, "No doubt he thought it was the only way to make his point. And also because he knew he could." If you ask him how can he protect Whiterun from the dragons, he'll say, "With good planning and constant vigilance. Even now, my court wizard, Farengar, continues his research into ways we might drive back these terrors. We must also have ample reserves of water to combat the fires that will surely spread after an attack. But our greatest weapon? Courage. For if we cannot kill the beast, we must at least have the tenacity to drive it back. Until brave heroes step forward to destroy these monsters, that is the best we can do." When exiting conversation, he'll say, "Next time, deal with Avenicci." and "Now if you don't mind, I've got a city to keep." When you're done speaking with Irileth and you tell her you have news concerning Helgen, he'll turn to you and say, "So. You were at Helgen? You saw this dragon with your own eyes?" You'll now have a few options. When you're speaking with Irileth and you tell her that Riverwood is in danger and that you need to speak directly to the Jarl, he'll call out to Irileth, saying, "It's all right, Irileth. I want to hear what he/she has to say." When you approach him, he'll say, "What's this about Riverwood being in danger?" You can now tell him a dragon destroyed Helgen and Gerdur/Alvor (whoever sent you) is afraid Riverwood is next, to which he'll reply, "Gerdur? Owns the lumber mill, if I'm not mistaken. Pillar of the community. Not prone to flights of fancy.../Alvor? The smith, isn't he? Reliable, solid fellow. Not prone to flights of fancy... And you're sure Helgen was destroyed by a dragon? This wasn't some Stormcloak raid gone wrong?" You can now either mention your criminal past or mention the dragon, getting the same responses as above. Alternatively, if you converse with him before talking to Irileth, he'll say, "Well. I trust you have something vitally important to tell me. Important enough to interrupt me in the middle of council?" You can now either say you have a message concerning the war, Riverwood is in danger, or you have news from Helgen, getting the same responses as above. 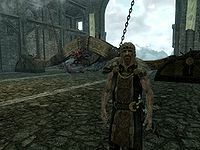 Proventus: "The Jarl of Falkreath will view that as a provocation! He'll assume we're preparing to join Ulfric's side and attack him. We should not..."
He'll then turn to you and say, "Well done. You sought me out, on your own initiative. You've done Whiterun a service, and I won't forget it. Here, take this as a small token of my esteem." and hand you a piece of leveled armor. He will continue, "There is another thing you could do for me. Suitable for someone of your particular talents, perhaps. Come, let's go find Farengar, my court wizard. He's been looking into a matter related to these dragons and... rumors of dragons." The next quest, Bleak Falls Barrow, will now start. 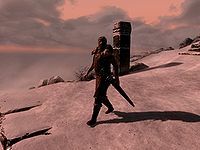 As you are walking over to see Farengar, he'll say, "I'll introduce you to Farengar. He can be a bit... difficult. Mages. You know." or "Farengar is probably puttering around in his lab. Day and night. I'm not sure he ever sleeps." When he gets to Farengar's lab, he'll say, "Farengar, I think I've found someone who can help you with your dragon project. Go ahead and fill him/her in with all the details." If you've previously spoke with Farengar, he'll say, "Farengar, I see you've already met my new friend here. I'm sure you two will get along famously." When Farengar is done talking he'll have the following conversation. During the quest he'll just say, "Bring back this tablet that Farengar wants and I'll be in your debt." or "That tablet is your priority now. Bring that back from Bleak Falls Barrow and I'm sure we'll have a lot to talk about." After you return the Dragonstone to Farengar, Irileth will bring you to him and he'll have the following conversation. If you attempt to talk to him before he's done talking with the guard and Irileth, he'll only say, "Not now." "Is it attacking the watchtower?" He'll then turn to you and say, "There's no time to stand on ceremony, my friend. I need your help again. I want you to go with Irileth and help her fight this Dragon. You survived Helgen, so you have more experience with dragons then anyone else here. But I haven't forgotten the service you did for me in retrieving the Dragonstone for Farengar. As a token of my esteem, I have instructed Avenicci that you are now permitted to purchase property in the city. And please accept this gift from my personal armory." You will receive an "Axe of Whiterun" as your symbol of office; the axe is a leveled weapon that carries a random enchantment effect. Farengar: "I should come along. I would very much like to see this dragon." Balgruuf: "No. I can't afford to risk both of you. I need you here working on ways to defend the city against these dragons." Balgruuf: "One last thing, Irileth. This isn't a death or glory mission. I need to know what we're dealing with." Irileth: "Don't worry, my lord. I'm the very soul of caution." If you talk to him now, the only thing he'll say is, "Help Irileth kill this dragon before it can attack Whiterun. There's no time to lose." The watchtower was destroyed, but we killed the dragon. "I knew I could count on Irileth. But there must be more to it than that." Turns out I may be something called "Dragonborn." "Dragonborn? What do you know about the Dragonborn?" I killed the dragon. I think I deserve a reward. "There's no question about that. It was a mighty deed. You've earned a place of honor among the heroes of Whiterun. But there must be more to it than that. Did something... strange... happen when the dragon died?" When the dragon died, I absorbed some kind of power from it. "So it's true. The Greybeards really were summoning you." That's just what the men called me. "Not just the men. The Greybeards seem to think the same thing." If you picked one of the other two options, you can tell him you may be Dragonborn or that you absorbed some kind of power, getting the same responses as above. Once he mentions the Greybeards, the next quest, The Way of the Voice, will start. Balgruuf: "That's the Greybeards' business, not ours. (to you) Whatever happened when you killed that dragon, it revealed something in you, and the Greybeards heard it. If they think you're Dragonborn, who are we to argue? You'd better get up to High Hrothgar immediately. There's no refusing the summons of the Greybeards. It's a tremendous honor." He'll then say to you, "You've done a great service for me and my city, Dragonborn. By my right as Jarl, I name you Thane of Whiterun. It's the greatest honor that's within my power to grant. I assign you Lydia as a personal Housecarl, and this weapon from my armory to serve as your badge of office. I'll also notify my guards of your new title. Wouldn't want them to think you're part of the common rabble, now would we? We are honored to have you as Thane of our city, Dragonborn." Who are the Greybeards? "They're the Masters of the Way of the Voice - of Shouting. They live up on top of the Throat of the World. If you're really Dragonborn, they'll want to talk to you. In the old stories, they always summon the Dragonborn for training." What's it mean to be Dragonborn? "Well, in the old tales, the Dragonborn heroes would use the power of their Voice to defeat the enemies of Skyrim. Wulfharth was Dragonborn. Talos, too - the founder of the Empire, back in the good old days. In the very oldest tales, back from when there still were dragons in Skyrim, the Dragonborn would slay dragons and steal their power." "This gathering is nothing more than a boast." Balgruuf: "It's all for a good cause, old chap. Ulfric Stormcloak? The rightful High King? That's bordering on treason, man! Stand up. Stand up, I say!" Balgruuf: "You take it back then? You retract your statement? Well?" Razelan: "I protest! This is an insult to the dignity of my person! This time I'm completely innocent!/This is preposterous. Disrespect... insulting! I am tired of being hounded from all sides!/Madame Ambassador, you know that I would never have behaved... that is to say... well I swear I'm innocent this time!" Balgruuf: "Tell your men to stand down. I don't need any help dealing with this kind of fool. He isn't worth the trouble. I apologize for the disruption to such a festive occasion." Razelan: "Absolutely not! I protest... uh, that is, yes, of course. I still don't understand what just... oh never mind./That is absolutely untrue! Uh, that is, yes, of course. What... I don't understand why everyone... never mind." It's only hopeless if we give up. "I didn't say anything about giving up. Now, what's this nonsense about trapping a dragon in my palace?" I'm Dragonborn. It's my destiny to stop him. "I don't know about such things, but I heard the Greybeards summon you. That's good enough for me. Now, what's this nonsense about trapping a dragon in my palace?" Maybe so, but I plan to go down fighting. What about you? "No Nord could have said it better!/Spoken like a true Nord. I'll stand beside you, Dragonborn. Now, what's this nonsense about trapping a dragon in my palace?" When you tell him it's the only way to stop Alduin, if the Civil War is still raging, he'll say, "I want to help you, Dragonborn. And I will. But I need your help first." If he has yet to join a side, he'll then say, "Ulfric and General Tullius are both just waiting for me to make a wrong move. Do you think they will sit idle while a dragon is slaughtering my men and burning my city?" If he's pledged allegiance to the Imperials, he'll say, "Do you think the Stormcloaks will sit idle while this dragon is slaughtering my men and burning down my city?" Either way, he'll then say, "No. I can't risk weakening the city while we are under the threat of enemy attack. I'm sorry." When you ask him if he would help if he didn't have to worry about an enemy attack, he'll say, "Then I would be glad to help you with your mad dragon-trapping scheme. But getting both sides to agree to a truce will be difficult at this point. The bitterness has gone too deep. Maybe... hmm... what of the Greybeards? They are respected by all Nords. High Hrothgar is neutral territory. 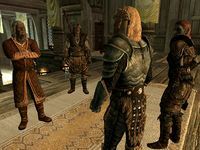 If the Greybeards were willing to host a peace council... then maybe Ulfric and Tullius would have to listen." When you tell him you'll get the Greybeards to host a peace council, he'll say, "Aye, Dragonborn. Maybe you can stop the dragons - and this war into the bargain." You can now ask if Dragonsreach was built to hold a dragon, to which he'll say, "According to legend. Although I never thought to put the tale to the test. Jarl Olaf One-Eye it was, who later became High King. They say he Shouted it into submission in single combat atop Mount Anthor and brought it back to Whiterun. Numinex was the dragon's name. That's his skull decorating the main hall." Before the peace council, if you try to make him set up the trap, he'll say, "My men will be ready when you are, Dragonborn. You have a truce to arrange first, eh?" Elisif: "Wait. General, you don't intend to just hand over Markarth to that... traitor." Balgruuf: "This is how the Empire repays us for our loyalty?" 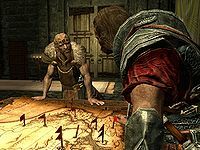 Arngeir: "Jarl Baalgruf [sic], I assume you are familiar with the Dragonborn's plan?" Balgruuf: "Yes, I'm ready to do my part. Just say the word, and my men will help you spring this trap." When it's all over, he'll walk all the way back to Whiterun, determined to keep his word, saying, "When I return to Whiterun, I'll get my men ready to help trap this dragon." After the peace council, or if the Civil War is already over, he'll say, "Then... Whiterun will stand with you, Dragonborn. We will take the risk, and gain the glory, whether it be in victory or defeat! So what's the plan, then? How do you intend to lure a dragon into the trap?" When you tell him you don't know yet, he'll say, "Oh... well, I'll leave that to you. I trust you know your business. Probably for the best. It will give me time to see if that old trap still works - and break the news to the men." If you once again ask if he's ready, he'll say, "We'll be ready, don't worry. You do have a plan for actually luring a dragon into this trap, don't you?" When you're finally ready, you can ask him if he's prepared, "As I promised, my men stand ready. The great chains are oiled. We wait on your word." If you tell him you're not quite ready, he'll say, "Now that it's upon us, I'm rather looking forward to the challenge. I'll be famouser than Olaf One-Eye!" When you tell him you're ready, he'll say, "My men know what to do. Make sure you do your part. I'm putting my city in your hands." "You'll be the toast of Whiterun for this!" As he arrives at the Great Porch, he'll say, "You do have a plan for luring a dragon here, yeah?" Once he gets in position, he'll only say, "Go ahead and call this dragon of yours. We're ready. ", "What are you waiting for? Let's get this over with. ", and "We're ready when you are." When fighting the dragon, he'll yell out, "Steady! Steady, now! Keep under cover until it's down!" and "Hold your fire until he's close!" When Odahviing is captured, he'll say, "Got him!" With the dragon captured, he'll greet you with, "I'm still amazed that your plan worked." or "You'll be the toast of Whiterun for this!" When you tell the guards to open the trap, he'll say, "Carry on, soldier. This is all part of the Dragonborn's plan." As you fly towards Skuldafn, he will shout, "May Kynareth guard you while you pass through her realm!" Once you get to level 20, you may hear rumors about Balgruuf's strange children. When you ask him about this, he'll say, "Yes, my youngest son. He's a dark child. I don't know what to do with him. He was always a quiet lad, but lately... something has changed. He's become brooding. Violent. He won't say a word to me, but I don't know how I upset him. If you could speak to him. Draw out the truth. I would be immensely grateful." 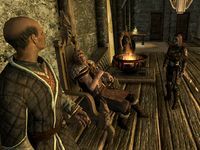 When talking to Nelkir, he'll reveal some interesting secrets about Balgruuf, saying, "I know that he still worships Talos. That he hates the Thalmor almost as much as the Stormcloaks do. That he worries about being chased from Whiterun. That he... that I'm... that I don't have the same mother as my brother and sister." Later in the quest, Mephala will command you to open the Old Wooden Door in the Dragonsreach basement. The Whispering Door key will now be added to Balgruuf's inventory. Since he's essential, you have to pickpocket him to get it. Balgruuf: "I'm not a fool, Proventus. I mean it's time to challenge Ulfric to face me as a man, or to declare his intentions." Proventus: "He'll do no such thing!" Balgruuf discusses the defenses of his city with Legate Cipius. The quest, Battle for Whiterun will now start. Why side with the Empire? "Mutual advantage! Any fool can see that. For centuries, we have benefited from the Empire's protection, and prosperous trade with the south. In exchange, the people of Cyrodiil sleep peacefully, knowing their northern border is guarded by the fiercest warriors in all Tamriel." What will it take to end the war? "Ulfric Stormcloak's head on a pike. 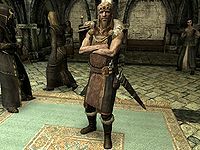 Do you think Ulfric really cares about Skyrim's independence, or the welfare or [sic] its people? I promise you, he doesn't. He's nothing more than a barbarian renegade, whose lust for power has cost the lives of countless innocents." "You have no place in Whiterun anymore." Balgruuf: "Vignar Gray-Mane! Your family was noticeably absent from the walls. Now I know why. Wouldn't a dagger in the back have sufficed?" Vignar: "You think this is personal? The Empire has no place in Skyrim... not any more. And you? You have no place in Whiterun anymore." Balgruuf: "A convenient position to hold now. But mark my words, old man, in the days to come, Ulfric will spread his rebellion thin. And what then? We need the Empire, as much as it needs us. We Nords are the Empire! Our blood built it. Our blood sustains it! You of all people should know that." Vignar: "If this was my Empire, I'd be able to worship whoever I damned well pleased. You wish to see an Empire without Talos? Without its soul? We should be fighting those witch-elves, not bending knee to them. The Emperor is nothing more than a puppet of the Thalmor. Skyrim needs a High King who will fight for her, and Whiterun needs a Jarl who will do the same." Balgruuf: "Tell me, Vignar. Was all this worth it? How many of those corpses lining our streets wear the faces of men who once called you friend? What about their families?" Galmar: "Enough! Both of you! There is a burning city out there that needs a government." Vignar: "He's right. Galmar, come, let us restore order." Balgruuf: "This isn't over. You hear me you old fool! This isn't over! (to the player) And you. A Stormcloak? I'd thought better of you. You'll all come to regret this day." If you talk to him after the following conversation, he'll only say, "I surrender! Give me a few hours to gather my household, and I'll depart. You have my word." Balgruuf will now spend his entire life in the basement of the Blue Palace, either sitting around or sleeping. When you approach him, he'll say, "After Whiterun is retaken, Ulfric will pay in blood for his insolence." When you notice his children aren't with him and you ask where they are, he'll say, "If the gods are merciful, they've found a safe place to hide in the city. I hope Vignar doesn't find them. He'll ask a king's ransom, I'm sure." Hrongar: "Have you reconsidered my idea?" Balgruuf: "I haven't changed my mind, if that's what you're asking. I won't leave Whiterun defenseless, even for a day." 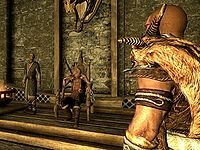 Hrongar: "If we send half our guards to aid the legions, just for a few days, it could tip the scales in the Empire's favor. The Companions can help protect the city, and the Emperor will be in our debt." Balgruuf: "Have you lost all sense? We are short on guards as it is! If we lose half our men, the Dark Brotherhood and Thieves' Guild will have the run of the city. The Stormcloaks will be the least of our worries! The answer is no, I tell you! Now stop pestering me with your war-mongering!" Balgruuf: "Heard about that, did you? Yes, I went out for a pint or two. What of it?" Balgruuf: "Damn it, woman, I'm the Jarl of Whiterun! I won't apologize for talking to my people. You can't protect me every moment of the day." 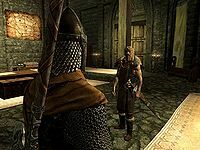 Balgruuf: "I won't say it again, Vignar - Talos worship is forbidden. It's the Empire's law, and we're still a part of the Empire." Vignar: "A law made at the tip of an Aldmeri sword, aye. A sword stained red with Nord blood. Is this what our people fought and died for? To forsake our most beloved ancestor and divine?" 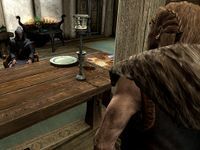 Balgruuf: "I'm no happier about this than you are, but I don't want the see the Thalmor rounding up people in the streets and throwing them in prison." Vignar: "Do your loyalties lie with the Thalmor, then?" Balgruuf: "I warn you, Gray-Mane, you are treading on dangerous ground." Vignar: "Don't threaten me, boy. You're either a Nord who respects our traditions, or you're not. If not, it isn't me you'll have to answer to, but the people of this city and this hold." In The Whispering Door, an initially planned part of the quest was that Balgruuf's other two children would have fallen under Mephala's influence like Nelkir, and would've eventually committed patricide. 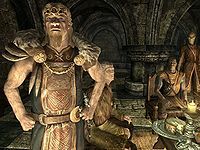 Upon Balgruuf's death, Hrongar would have replaced him as Jarl, but since these quest stages do not trigger, it never happens. If Whiterun is conquered by the Stormcloaks, his three children will not move to the Blue Palace with him. This issue has been addressed by version 1.2.2 of the Unofficial Skyrim Patch; his children will move to the Blue Palace.